Seeking an elegant appetizer recipe? 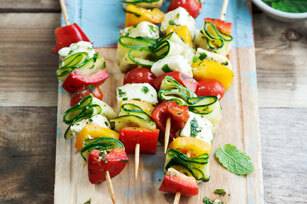 Check out our Marinated Vegetable & Cheese Skewers recipe. These vegetable-and-cheese skewers look fancy, but are actually quite easy to make. Trim zucchini; discard ends. Use vegetable peeler to peel each zucchini into 18 thin lengthwise slices. Thread vegetables and cheese alternately onto 12 wooden skewers, folding each zucchini slice accordion style before threading onto skewer. Brush evenly with dressing. Grill 2 to 3 min. on each side or just until vegetables are heated through and tomatoes begin to blister. Prepare using an orange or yellow pepper. Garnish with sliced fresh basil leaves before serving.